Welcome to my world! I love to write about life on lots of levels. Sometimes my blogs are funny, sometimes a bit sarcastic and ironic, but they are always informative and entertaining. Feel free to leave comments and ideas! 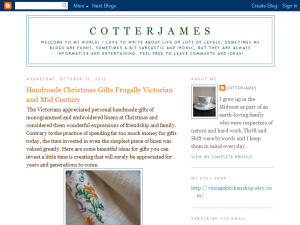 This what your Cotter James Blog Ad will look like to visitors! Of course you will want to use keywords and ad targeting to get the most out of your ad campaign! So purchase an ad space today before there all gone! Just a few pictures of wonderful glass full of color to brighten your day! document.write (window.ccvault_widg.framehtml(31595,3,3,2,1,0,0)); Treasuries are curated by members of etsy who put together a collection of the things that appeal the eye. Here is a neat combination of vintage treasures! If you are the owner of Cotter James, or someone who enjoys this blog why not upgrade it to a Featured Listing or Permanent Listing?